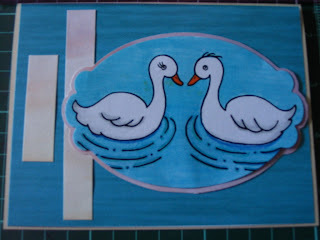 Just a quick post today, over at Crafting with Deedee's, she is having a sketch challenge. You have until Sunday night to join in the challenge. Here is my card, I used the "for the lovebirds" digi that she has at her store here, go over and take a look. What a beautiful blue card DQ! Did you color the background paper yourself to make it look so much like water? It's perfect for the sweet little lovebirds!